President Donald Trump visits POET – Gowrie in November 2015 during his presidential campaign. The oil industry threw a flurry of “reform” punches at the Renewable Fuel Standard (RFS) in 2017, but President Trump put up his guard for biofuels in his inaugural year, backed by the will of millions of voters in rural America and strong biofuels advocacy work in Washington. Two punches in particular could have done serious damage: changing the “point of obligation” – letting refiners off the hook for compliance with the RFS – and lowering 2018 biofuel blending volumes. Neither struck home as the Environmental Protection Agency (EPA) in consecutive decisions this November first maintained the point of obligation and then increased the 2018 biofuel volumes over its previous proposal. These wins come at a critical time for agriculture, as American farmers face fluctuating commodity prices, declining profits and rising corn yields. The timing is also key for continuing to improve market access and meet the growing demand for E15 across the country. In November, the EPA ruled to maintain the RFS point of obligation. A small group of oil refiners – led by billionaire businessman Carl Icahn – worked for the past year to move this obligation and thus eliminate their responsibility to comply with the RFS. This would have created mass confusion in RIN (renewable identification number) markets and undermined a successful RFS compliance process that has been effective for more than a decade. Most importantly, it would have eliminated incentives for retailers to offer new, high-octane E15 blends, stunting the growth of biofuels in the U.S.
Industry leaders from POET and Growth Energy applauded the EPA for this decision and thanked key biofuels champions in Congress for working to uphold the RFS and halt efforts from Big Oil. The biofuels industry also garnered a significant win in late November. The EPA’s final rule on the 2018 Renewable Volume Obligations (RVOs) under the RFS upheld the statutory target for conventional biofuels. RVOs determine the minimum amount of renewable fuel to be blended into the U.S. fuel supply for a calendar year. Grassroots and industry efforts, along with biofuels champions in Congress, helped secure 15 billion gallons for starch-based biofuels and increased the amount of cellulosic biofuel from the EPA’s original proposal. Thirty-eight senators signed on to a letter defending the RFS and full statutory levels for the 2018 RVOs, demonstrating strong support in Washington for the industry. While these efforts show the industry is gaining traction, there is still much work ahead, and opponents remain strong, well-funded and more motivated than ever. Big Oil spent more than $119 million to lobby federal lawmakers in 2016, according to the nonpartisan research group OpenSecrets.org. Oil-state senators, led by Sen. Ted Cruz (R-Texas), continue to ask President Trump and his administration for RFS reform and bailouts for refiners, most recently during a Dec. 7 meeting with eight other Republican senators. The oil and gas industry is hitting the news media and pushing to upend the Trump administration’s recent decisions with so-called “reform” measures aimed at crippling the RFS and halting the growth of E15. “We’re near a critical tipping point for many issues. This year we saw more attacks than ever from the oil and gas industry, and it’s clear that there are big battles ahead. We need to keep this momentum going. It’s important for us to redouble our efforts and for our champions to stay strong,” Gilley says. One priority is to secure a year-round Reid Vapor Pressure (RVP) waiver for E15. 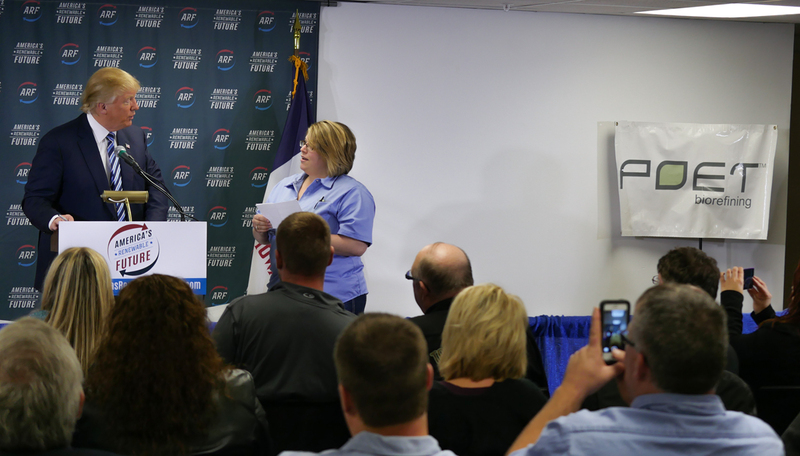 The EPA is tasked with looking for an administrative fix for the RVP issue, and POET will continue to pursue every available option to move this crucial issue forward and speed availability of E15 to drivers across the U.S. POET will also continue working to improve the EPA’s understanding of cellulose in advance of the proposed 2019 volumes. Stay tuned to POET’s policy page for important updates.